I have been so very fortunate to be the recipient of several blog awards over the past couple of weeks. I have not been very cordial in publicly thanking those who were kind of enough to give me an award, and I apologize. The end of the school year is always more hectic than I ever anticipate, and time just got away from me. Without further ado, however, let me share my heartfelt appreciation to the award givers….and let me pay forward the gift to a few fellow bloggers. 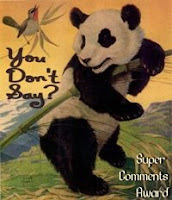 The next award that I received was the “You Don’t Say” award — with the most adorable Panda Bear button! This award acknowledges those who frequently comment on the others’ blogs. Sheri from A Novel Menagerie and Melissa of Melissa’s Bookshelf both bestowed me with this terrific honor. As you all know, we bloggers CRAVE comments as it is our barometer that what we say has meaning to others. Fleur Fisher finds me friendly (how’s that for alliteration?) and I am deeply touched. I am a shy person in the real world, and oftentimes viewed as stand-offish rather than friendly – so it is especially nice to know that I can communicate affability in the blogging world. The Book Resort honored me with her Splash award: What is a Splash Award ? 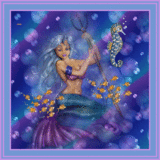 It is an award given to alluring, amusing, bewitching, impressive & inspiring blogs. My family is probably reading this description and asking, “who are they talking about? !” Not sure they would use the words alluring or bewitching to describe me 🙂 — but I am very grateful for this fantastical award. Chris of Stuff as Dreams are Made on…. 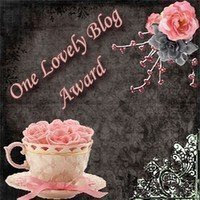 The final award that I have been fortunate to receive is the Lovely Blog award from Karen at The Pink Bookmark. I think the button is appropriate to the award — it is quite lovely. I found Karen’s blog during the readathon event and have really enjoyed reading her insightful comments. I thought I would pass along this award to the few bloggers I know who have recently converted their blog to their own domain. I simply cannot imagine the work and skill necessary to accomplish such a feat – and their new blogs are indeed lovely. For those who have done this and I am unaware, please forgive my oversight and know how much I admire your efforts! Awesome awarding going on here! So well deserved, Molly. And thanks so much for passing one of these along to me! Congratulations, Molly! And thank you for my adorable enchanted award. I am now a follower and am adding you to my blog roll. I looked over your blog and can’t believe I haven’t been here before. What a super blog you have. It just goes to show that even if we had all the time in the world, we would never get to see all the wonderful creative work that is out here…thanks again and have a super weekend! Congratulations, Molly! Your blog is fantastic, so I’m not surprised you got all those awards. Thanks for thinking of me to pass one along to. I’m really flattered! Congratulations on your awards, and thank you so much for awarding me the Friendly Blogger award! What a nice way to start out the weekend. Congratulations on your well-deserved awards, and thanks for passing the Friendly Blogger award on to me! Hope you have a great Memorial Day weekend! Congrats on all of the lovely awards, Molly! Not just friendly, but fantastically fabulous! Whoa, don’t you just love alliteration? Thank you so much Molly for passing on the “You don’t say” award. He is truly an adorable bear. I always look forward to anything you post. Have a nice holiday weekend. Wow!! It’s an award bonanza! All very thoughtful and well deserved. Thank you for passing on the “You Don’t Say” award to me. I really enjoy visiting your blog and commenting is really important to me so I really appreciate it. Congratulations, Molly, on an array of well deserved awards. Thanks for passing one along to me. It means a lot. I want you to know that I do subscribe to your blog and still read nearly all of your posts. I’m not the best “commentor” even though I’m reading and lurking! Bravo Molly! What a lot of love you have received! Thanks for passing some of that love on to me. Congrats on all of your very well deserved awards Molly!!! Your blog is one of my favorites and you have such a positive spirit that shines through in your writing. Thank you very much for the “You don’t Say” award!! I am honored and you’ve made my day! You MUST see Schindler’s List–even if it is after you read the book. The visual aspects of that film are stunning, and after watching it for the first time many years ago, my husband looked at me and said, “This is one movie all our children must see.” He had never said that before or since about any other movie. While it is a sickening period of history, and we automatically think of the sick people who orchestrated those events when we hear the words WWII or Holocaust, I have found through mostly books, how there were so many good people too–those are the stories I like to find. Awww, thanks so much Molly 😀 And you put me in such great company! All of those awards that were given to you were extremely well deserved! Congratulations on the awards, Molly! You definitely deserve ’em! Congrats on all the well-deserved awards!!! And thank you for thinking of my blog!! I totally appreciate it! WOW you got so many wonderful awards!! They are so pretty, and you sure do deserve them. Thank you so much for passing one on to me! Your words are very kind (here and in the comments you left on my blog) and it is a HUGE encouragement to me. Thank you, I really appreciate your sweetness. Thank you so very much, Molly, and congratulations on all your well-deserved awards! Thank you so much! And congratulations on your awards! Congrats on all your blog awards! Thank you for thinking of The Printed Page. I love my ‘Your Blog is Enchanted’ award. Thank you for sharing an award with me!! Hi Molly – my apologies in how belated my thanks are to you for acknowledging A Novel Challenge for the Enchanted Award!! I've posted about it today here.